With time, comes and opportunity to look back, and in some cases, model the looks of the past. 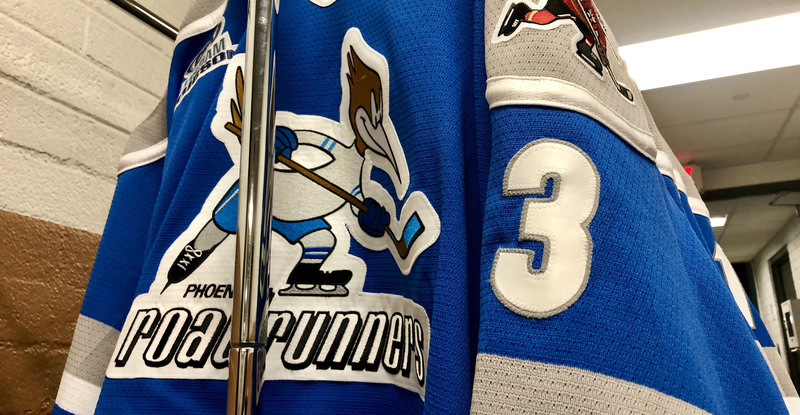 Good morning from Tucson Arena, where this evening, the Roadrunners will don the oh-so wonderfully dressed uniforms mirroring the IHL-era Phoenix Roadrunners, paying homage to the former members of the International Hockey League from 1989-97. 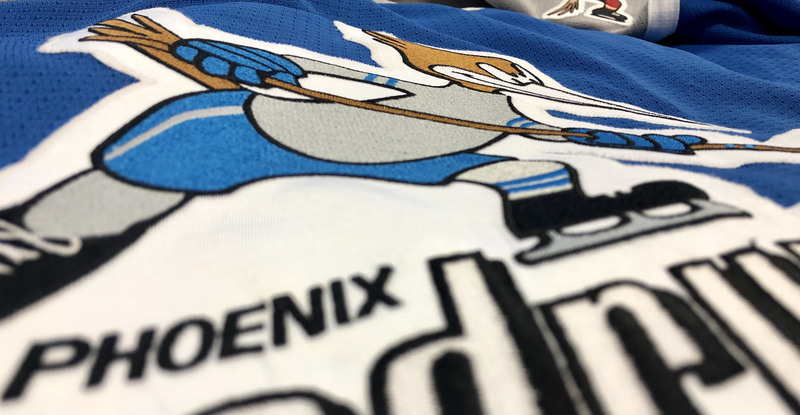 That club, which sported baby blue, silver and white, played at the Arizona Veterans Memorial Coliseum and made the Turner Cup Playoffs in three of its eight seasons, twice making it to the quarterfinal stage. A handful of alumni will be on hand for the ceremonial puck drop and additional in-game festivities, including Michael Vukonich, Ed Kastelic, Shawn McCosh, Jeff Shevalier, Darryl Gilmour, Tim Watters, and Sean Whyte. 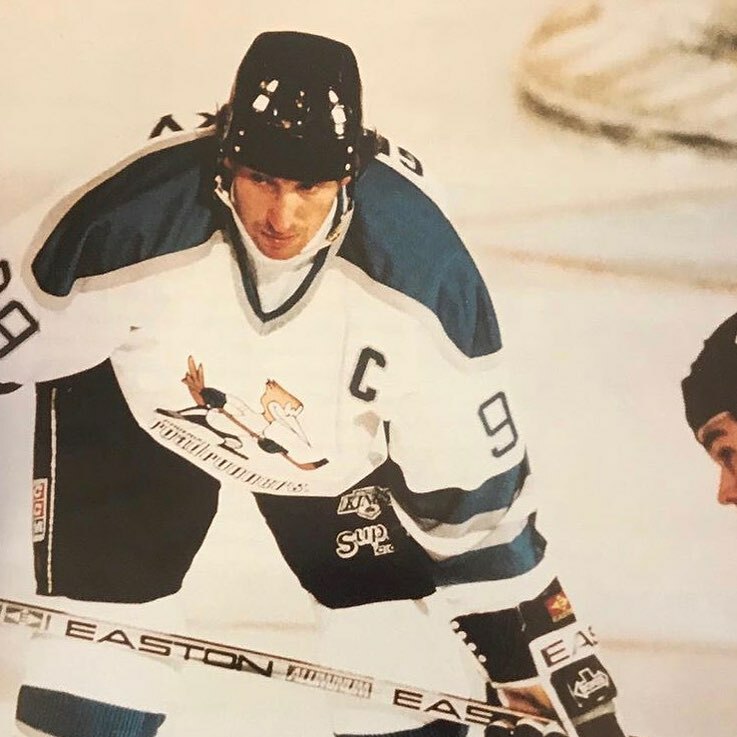 Wayne Gretzky even once donned the logo, colors of which will be featured tonight in 1993 during an exhibition contest when Phoenix was the primary affiliate of the Los Angeles Kings. Tonight, the Roadrunners look to halt their current three-game losing streak, the longest of such this season, as they put the finishing touches on a six-game home stand before venturing off on a season-long six-game road trip. Obviously it’s always good to be within a goal or two at the end of the game, but I don’t think we played our game, but the upside, I guess, is that if we do play our game then we have a good chance of winning. I think they just play a pretty defensive game, and I think that when we stick to our game over the full 60 minutes it starts to work for us toward the end, but when we don’t stick with it and we get a little bit frustrated and get away from our game, that’s when it comes back to bite us, so we’ve got to make sure we stay focused, stick to our game plan, and play it for the full 60 minutes. We’ve lost three in a row now, so we don’t want to lose too many games in a row, and especially now before this road trip, it would be good to get on the good side and get a win before we go on the road for that long trip, it would be nice to get back in the win column before that same challenge presents itself on the road. They’re sweet. I’ve seen those jerseys plenty of times, they’re really cool, really nice, it’s going to be fun to wear them and hopefully we get a big crowd for them.